This is the first article I have found that effectively communicates the reality of narcissistic and psychopathic abuse from the abuser’s perspective. To help you understand the mind of these evildoers you’ll need to understand about; Gaslighting, a primary tactic of mind control used by psychopaths, sociopaths, narcissists, borderline and other abusive personalities. Gaslighting is a form of thought control. The goal is to silence the partner’s voice. Because of its effectiveness an abuser uses it habitually as a quick fix to end a conversation, he doesn’t want to be in, and more specifically, to redirect the focus to what he calls the victim’s issues e.g., nagging, being too emotional or too controlling. Gaslighting can also be used just for kicks to see the victim squirm. It can cause the partner’s brain to go into doubt, confusion and ultimately, it makes the victim feel—she is going crazy. This form of thought control conditions and trains the victim to not do what is natural—such as to feel that her thoughts, feelings, ideas and opinions are valid. The victim also is conditioned to not protect herself (especially from her abuser) because when she tries to bring up his issues he shifts the blame onto her. Gaslighting is a form of psychological torture. Using Gaslighting habitually prevents the abuser from developing empathy and compassion— key elements of what it means to be human. The abuser’s emotions become numb so he doesn’t feel vulnerability and pain. The result is a range of behaviors, which, on one side of the spectrum, consist of narcissistic tendencies and on the other side, can become a full-blown sociopathic disorder. I hope you enjoy the article as much as I have. My desire is to help increase awareness that the victim needs our compassion, patience and support as they share their “crazy” stories and go through the long and treacherous road of recovery. What I’m about to say is not something I’d ever say or admit (to you), because to do so would end the winner-takes-all-game that is my main source of pleasure in life — one that effectively keeps you carrying my load in our relationship. And that’s the whole point. It makes me light up with pleasure (more proof of my superiority) that I can easily get you flustered, make you act “crazy” over not getting what you want from me, make you repeat yourself, and say and do things that you’ll later hate yourself for (because your niceness!). Everything you say, all the hurts you share and disclose, you can be sure, I’ll taunt you with later, to keep you ever-spinning your wheels, ever explaining yourself to me, ever-confused trying to figure me out (until you learn your lesson). I love that I can make you feel insecure at the drop of a hat, especially by giving attention to other women (but also my friends, family members, work, children, etc. … the list is endless), taunting and making you beg for what I easily give to others, wondering why it’s so easy for me to express feelings, affection or compliment others, that is, when it serves my pleasure (in this case, to watch you squirm). I love the power I have to get you back, by throwing a few crumbs your way when you say or threaten to leave, then to watch how quickly you return when I turn on the charm, deceiving you into thinking, this time, I’ll change. “I love you” means that I love fixing and shaping your thoughts and beliefs, being in control of your mind, so that you think of me as your miracle and savior, your source of life and sustenance, so that you keep bouncing back to me, like gravity, no matter how high you try to jump or fly away. I love that you make me feel like a god, focused on making me feel worshiped and adored, sacrificing everything for me, seeking to please none other, and inherently, with sole rights to administer rewards and punishments as I please. I love how I can use my power to keep you down, doubting and second-guessing yourself, questioning your sanity, obsessed with explaining yourself to me (and others), professing your loyalty, wondering what’s wrong with you (instead of realizing that … you cannot make someone who derives a sense of power and pleasure from feeling scorn for others … and you!). 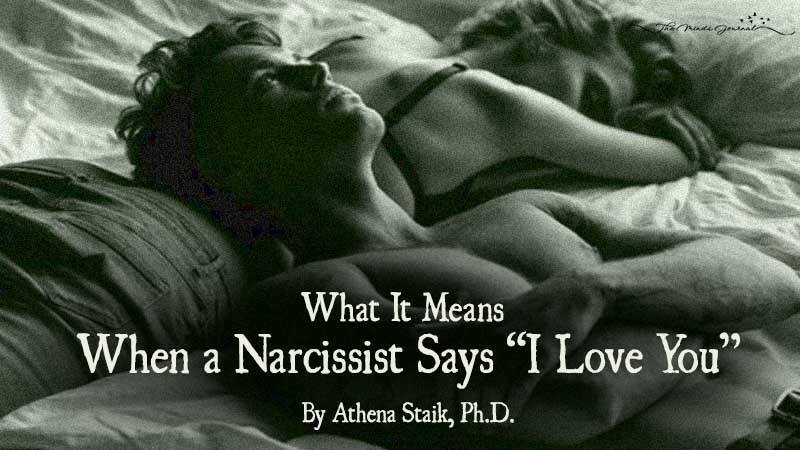 The post When a Narcissist Says “I Love You” appeared first on Fearless Love.